Is the modern view called “inerrancy” really the view of the Bible that orthodox Christians have always held? Prompted by some recent (but, I think, quite wrong) criticisms of my stance as a conservative Christian who doesn’t accept the belief that the Bible must be seen as inerrant, I’ve been reflecting over the last couple of days on the fact that – as with other doctrines – plenty of evangelicals today assume that since they believe something and so does everyone they associate with, this must be the “orthodox” view, and it must belong to all orthodox Christians in history. Some evangelicals, understandably keen to trace key elements of their own theology back throughout church history, have claimed that their doctrine of inerrancy has uniformly been taught by conservative Christians of all ages. While there has always been a clear expression of the view that what Scripture teaches is correct, this has certainly not always been seen in terms of the notion of “inerrancy.” After all, the very disagreement that exists between evangelicals who affirm inerrancy and those who do not is a disageement about whether or not the idea that the Bible is authoritative and truthful in what it teaches us should (or need not) give rise to the further claim that the Bible is also inerrant. Discussions of inerrancy specifically formulated didn’t take place until the modern period, so nobody is going to be able to produce a statement from, say someone in the fifth century saying “I affirm the doctrine of inerrancy.” Certainly, there is plenty of material to quote claiming that the Bible is authoritative and that it contains no false teaching. But here and there over the centuries we do get a window on how some theologians taught about the existence of small errors or inconsistencies in the biblical record, and what to make of them. ‘But the contrary,’ it is said, ‘has come to pass, for in many places they are found to disagree with each other.’ Yet, this very thing is a great proof of their truthfulness. For if they had agreed exactly in all respects, even as to time and place and to the using of the same words, none of our enemies would believe that they had not met together and had not written what they wrote in accord with some human compact….But as it is, the discord which seems to be present in little matters shields them from every suspicion and clearly vindicates the character of the writers. This apologetic is also used today, and it’s a perfectly reasonable one. The fact that the Gospel writers don’t agree in every respect about when things took place, what contexts certain things were said in (like who Jesus was speaking to and why when he said the things he said), minor details of narrative accounts etc., isn’t really a reason to reject them (you might reject Chrysostom’s view that such minor errors/inconsistencies do exist, but that’s not the subject of this article). Instead it shows that those who compiled them were just being honest. They used what they got from their sources, and if that material didn’t perfectly agree with what another Gospel writer said, they included it anyway. If the Gospels were fabrications, and the writers got together and cooked up their stories about Jesus, they wouldn’t have intentionally put apparent errors there. They would have smoothed such things over and made them agree as perfectly as possible on the details. Therefore the state of the Gospels that we have actually speaks favourably of their reliability and also of the character of those who put them together. But this apologetic that Chrysostom is using can only work if there are in fact discrepancies between the Gospel accounts. This fact is presupposed in his argument. Martin Luther did say, “The Scriptures … do not lie or deceive” and “The Scriptures have never erred,” along with other similar statements about Scripture. Since inerrantists are able to express their view by using those same words, it might be assumed by an inerrantist that Luther meant what some modern evangelicals mean, namely that the Bible is inerrant, and nothing that it contains is inaccurate at all. But this was definitely not Luther’s view – not even close! He notoriously claimed that the epistle of James taught a clearly untrue view on justification, and he also believed that the book of Hebrews taught false doctrine in denying the possibility of a second repentance after turning away from the faith. He also did not regard the book of Revelation as inspired, but in fairness he didn’t say that it taught error. In his commentary on Matthew chapter 2, Calvin offers a brief comment on the star that the Magi followed. “It is more probable that it resembled a comet, and was seen, not in the heaven, but in the air. Yet there is no impropriety in Matthew, who uses popular language, calling it incorrectly a star.” As Calvin would have known full well, the ancients were familiar with comets (so the mode of writing of his time certainly never required him to call it a star), but he considers the “incorrect” claim of Matthew to be so minor that it does not even warrant being called improper. “Then was fulfilled what was spoken by Jeremiah the prophet.” How the name of Jeremiah crept in, I confess that I do not know nor do I give myself much trouble to inquire. The passage itself plainly shows that the name of Jeremiah has been put down by mistake, instead of Zechariah, (11:13) for in Jeremiah we find nothing of this sort, nor any thing that even approaches to it. Errors like the two I have cited Calvin acknowledging are not matters of the Gospel writer selecting or omitting different material than another Gospel writer or reporting events in a different order. Instead, they involve the claim that a biblical writer affirmed something that was not correct. These are errors. Whatever Calvin might have declared about the authority of Scripture, he believed that it affirmed unimportant errors. In his commentary, Matthew Henry does not draw attention to the error, but he tacitly acknowledges it. Matthew mentions Jeremiah and not Zechariah, but referring to Matthew 27:9, Matthew Henry states, “It fulfilled a prophecy, Zec 11:12.” Where did Henry get Zechariah from? He got it from his realisation that this prophecy was not given by the prophet that Matthew referred to, but by another altogether. The conservative Reformed theologian Charles Hodge, widely loved by those who espouse inerrancy, like Luther and Calvin, admitted that what he called “errors of fact” and “discrepancies” that cannot currently be explained. Like me, he simply did not think that such minor errors really matter. The errors in matters of fact which skeptics search out bear no proportion to the whole. No sane man would deny that the Parthenon was built of marble, even if here and there a speck of sandstone should be detected in its structure. Not less unreasonable is it to deny the inspiration of such a book as the Bible, because one sacred writer says that on a given occasion twenty-four thousand, and another says that twenty-three thousand, men were slain. Surely a Christian may be allowed to tread such objections under his feet. The errors in the Bible, said Hodge, are like specks of sandstone in the Parthenon. Clearly it’s true to say that the Parthenon is made of marble, even if it contains a few irrelevant bits of sandstone in it. Likewise, what the Bible teaches us is true, even if there are a few irrelevant errors in it. Compare this to the attitude of inerrantists who think that any errors in the Bible undermine the overall truth of what it says. This is not to say that Hodge nowhere make claims that sound like sweeping declarations of the Bible’s absolute inerrancy. But the fact that he allows for errors shows that he cannot mean that the Bible is without error in every single matter that it mentions. This is an insightful (albeit unwittingly so) description of how some evangelicals can paint themselves into a corner over this issue, and once there, of the intense fear that there is no way out without conceding the fight to the enemies of conservative Christianity. The reality is, they should never have put themselves into that predicament to start with. What is so shocking about saying that Scripture is inspired and its message is completely true, but allowing that some matters contained in Scripture actually do not contribute to its message and on historical and scientific matters it might not meet high standards of accuracy? As a way of coping with the challenge of liberalism, the leap to inerrancy has simply been a failure. You do not respond to a liberal outlook wherein Jesus did not even rise from the dead by flinging your perspective on Scripture to the far side of the playing field, where it becomes a textbook on science, political history, geography and anything else it mentions apart from its central message. Taking extreme measures like this actually resulted in running away from liberalism to a secluded intellectual conclave, rather than actually engaging liberalism head-on, unravelling its presuppositions on such issues as the resurrection of Christ, showing that liberalism is little more than trendy scepticism without any good rational foundation (as do, for example, contemporary apologists like William Lane Craig or Gary Habermas). The fact of the matter is that no ancient Church council ever debated the issue of inerrancy, let alone pronounced favor of it. No ecumenical creed even addresses the issue––not the Apostle’s Creed, not the Nicene Creed, not the Athanasian Creed. None of the Reformed confessions that Calvin College adheres to asserts Scripture’s inerrancy, but rather its “sufficiency.” As the Belgic Confession states, “We believe that this Holy Scripture contains the will of God completely and that everything one must believe to be saved is sufficiently taught in it” (Article 7). The great theologians of the Church, including Protestant Reformers like Luther and Calvin, had the highest regard for Scripture’s inspiration, authority and truthfulness, and at times they used words like “infallible” and even “unerring” when affirming its truth claims. But they also acknowledged factual discrepancies and other problems in the Bible and recognized the cultural limitations of its human authors. So if inerrancy is supposedly the “historic position of the Church,” as ___ asserts, how is it that the Church’s great councils, creeds, confessions and theologians missed the boat? The answer, I think, is clear: there was no boat to miss. Instead, the current insistence on inerrancy in some quarters of Protestant evangelicalism has its origins in late 19th- and early 20th-century overreactions to modernism. Indeed, the insistence on inerrancy represents a capitulation to the modernist framing of the debate, born of an all-or-nothing mentality in which the Bible is either completely accurate in every factual detail or completely untrustworthy in all of its theological claims to truth. This is a false dichotomy that many thoughtful Christians refuse to accept, and rightly so. While Protestants and Catholics clearly disagree over the role that Scripture should play when considering what it is that has primacy or primary importance in theology and ethics, the quality or truthfulness of Scripture has never been an issue between Protestants and Catholics. And as it happens, I think that the Catechism of the Catholic Church in section 107 is right on the mark in what it says about this about Scripture. The inspired books teach the truth. Since therefore all that the inspired authors or sacred writers affirm should be regarded as affirmed by the Holy Spirit, we must acknowledge that the books of Scripture firmly, faithfully, and without error teach that truth which God, for the sake of our salvation, wished to see confined to the Sacred Scriptures. I have emphasised part of this to show that the concern here is not with every single claim, even passing claims about the cosmos, geography, science, history, but rather with that truth that is for the sake of salvation, namely the salvation history as it has been called. I haven’t argued in this particular article that inerracy is false, although it is false. My point has only been a historical one. Anticipating one possible (but ineffective) line of argument against what I’ve said here, let me point out that I have not denied that any theologians in history, even in ancient Christianity, have taught anything like inerrancy. What I have said is that it is simply wrong – factually mistaken – to suppose that the modern view that goes by the name “inerrancy” should be taken as the default historical Christian stance. It is one option that some Christians hold and have held. I don’t hold it, and those who do hold it (some of them at least) are sometimes guilty of rewriting history in their minds, assuming that if they believe it, everyone does (or at least has). Thanks for this survey Glenn. It always serves the Church well to be reminded that our brothers and sisters have usually spoken about these things. It always helps to be reminded that Christianity was not created for modernity or post-modernity or some era of academic discourse and rhetoric. I would love to believe in a doctrine of inerrancy (if only the Bible taught one). As a person who comes from the inerrantist background, I had a few options when I started reading Gospel harmonies or textual notes — I could dump the whole thing (like Bart Ehrman) or I could continue to remain under the Scripture’s authority while remaining open to the wonderful (God-given) complexity of the texts and how they worked together to tell of God’s great work. One of the difficulties with inerrancy is that it demands God to do something He never promised to do. It insists that God re-write His Scriptures according to our editorial standards. It demands that He use sources the way we would and it refutes his choice of witnesses and voices and perspectives. Inerrancy is born, I think, out of a problematic understanding of inspiration (does that word appear in the Bible? I thought it was more like ex-spiration — God-breathed, God-moved). Most of us (and I definitely include myself) don’t know what to do with this doctrine. Is it inspired, in the way that a sunset inspires an artist? Or is it inspired as the way that a scribe takes dictation? I sympathize with the need for inerrancy, but not with the artificial structure inerrantists place upon the text. Sometimes, I wish God didn’t give us the Bible we have, but a nice, systematic text — something like The Institutes or Summa Theologica. But He gave us these Scriptures in the way He wanted to give them. And we are free to reject them like a publishing house (or Bart Ehrman) for not meeting our standards, or embrace them and live under their authority and mystery, searching them, with the guidance of His Spirit and within the community He created. God doesn’t give us a third option. Interesting question about “inspired,” Joe. No, that specific word doesn’t appear in the Bible, but the idea of being breathed by God clearly tells us of the divine origin of what Scripture tells us, so I don’t know how much difference the absence of “inspired” makes. And you’re right, the biblical writers never felt the need to express the idea of inerrancy – never. I actually don’t sympathise with the need for inerrancy. I sympathise with the need for authority, and inerrancy just isn’t needed for that. I know what the inerrantists really want to affirm – that Scripture is dependable, that the things it teaches us are true, that liberalism is untenable as a Christian position etc., but inerrancy just isn’t the correct way to address all these things. I affirm what the inerrantists really want to affirm, but I just think that they are misguided in their attempted solution. I would like to understand what you are affirming better. You may have answered this somewhere, but I have not read it… maybe I missed it! The doctrine of “inerrancy” is technically speaking of this as it relates to the Original Autographs only, which Carson even notes in the video you have linked to? Do you hold that the original autographs are inerrant? If so, why… If not, why not? I know what the inerrantists really want to affirm – that Scripture is dependable, that the things it teaches us are true, that liberalism is untenable as a Chriastian position etc., but ienrrancy just isn’t the correct way to address all these things. I realise that it’s hard for those with a strong committment to inerrancy to imagine a Bible that is neither inerrant nor fraudulent and worthless. – if you realize it’s hard, then please spell out for these people exactly how you think an errant bible can nonetheless be trusted. Beyond that, I’m not convinced that you are arguing for a concept that is much different than, e.g., the Chicago Statement’s position anyway. I think this is why I’m discouraged that you seem not to see that your definition of ‘error’ is not exactly the same as the one your opponents are using. The Chicago statement, for example, while affirming inerrancy, allows for the possibility that there are things in scripture that seem like ‘errors’ to us but would not have been seen as errors by the writers You think that scripture is inspired and authoritative on important matters yet contains things that would be called minor errors by our cultural standards. I’m not actually seeing much of a functional difference between your position and theirs; I’m inclined to think that I’m only seeing semantics. Tuckster, here’s why I have a problem with the Chicago statement: It takes an ordinary, understood English word like “error.” Then it says that the Bible doesn’t have any errors at all. Then it proceeds to say that we have to take this claim with a grain of salt, by allowing that the Bible is allowed to use the standards of accuracy that were acceptable in its day, which just were not as high as today, and tolerated a bit of, well, error. If that isn’t like a person saying that he’s right even when he’s wrong, I don’t know what is! Secondly, however, even if I gave the Chicago statement a free pass and just let them make up new meanings for words, so that its framers can enjoy the psychological comfort of being able to say “the Bible is inerrant,” witht he caveat that as a product of its day, it might contain a few errors, the type of errors that are mentioned in the above post are actually not of the type that the Chicago statement allows for. For example, in another place the Chicago statement allows for an author to re-order the events that he records, or have a different selection of material. But none of the very minor errors that I have referred to here or eslewhere (or which the theologians cited in this blog entry) fall into this category at all. Instead, they are just cases of minor claims being made that are incorrect. By far the most understandable and economic theory that explains this is that the Bible isn’t inerrant when speaking on unimportant matters of fact. I find that resistance to this possibility is not born of fair consideration of the facts, but rather opf a desire to be able to make the utterance “I believe in biblical inerrancy” so as to either feel better about how secure his faith is, or to fit in with expected evangelical norms (like Norm Geisler). That sounds a little unkind I know, but it’s what I think is the case. Yes, I’m talking about the autographs. Even defenders of strict inerrancy would admit that many of the copies are errant. I don’t think the autographs are inerrant. We have no good reason to think that the errors I’ve suggested in my previous post or over at Dominic’s blog, or which other theologians have suggested (a couple of examples appear in this blog entry) are the result of copyist error. As far as our best text critical information tells us, these errors were part of the original autographs. What I am affirming is, I think, a very modest claim: That the message of God presented in Scripture is without fault. Nothing that Scripture sets out to teach is wrong. However, the Bible contains material that is not part of that message (e.g. where did Jesus meet the Demoniac, what did people see in the sky when Jesus was born, who was the political ruler at X time, how many people first went to the tomb, what shape is the earth, and so on). What I’m affirming is that the message of God is true, and the surrounding material in which that message is couched may or may not contain errors. I happen to think that it does, but the main point is that it’s capable of erring with no major consequences. Glenn, I can cope with your position, it is held by my pastor for one. What I find difficult is how you treat inerrancy and your comments about the Chicago Statement. We are all stuck with language and some concepts may be difficult to describe with a few words. There is not a single word in English that describes the full Chicago statement. But terms like error, errant and inerrant cover what they are discussing reasonably well and better than other English words; especially when one considers the statement clarifies what they mean. If one happens to believe the Bible is without errors of fact, then the Chicago statement is a reasonable position to hold. If one thinks there are errors of fact then one will not hold it. But those same 2 people believe the same thing about a specific question then you cannot claim that your position precludes theirs. Nor can you add to your oppositions view and show it incorrect when they do not hold as such. At least you must prove that your suggested addition is logically required by their position. For example you use the term “high standards of accuracy” but this is not what inerrantists hold. While some aspects of Scripture are highly accurate, inerrancy demands adequate or appropriate accuracy. To give a number to even 1 significant figure is accurate (even by Western standards) it is just not overly precise. To give stories out of chronological sequence is not errant. Defend your position on errancy, but don’t paint inerrantists into a smaller corner than you claim they have done for themselves, then cry foul when they are found outside your bounds. Firstly, as written it is false. I acknowledged that recording events in a different order, or selecting different material from another narrator is not errant. However, the statement is false because there are errors in minor matters of fact that do not fall into such categories. Secondly – and this is where you complain – I think the statement is slippery. You actually misunderstand me here. I did not say that the Chicago statement uses high standards of accuracy. On the contrary, it uses low standards of accuracy, meaning that it can use the word “inerrancy,” but allow for errors! In fact I don’t think it’s hard to sum up an adequate statement here in one phrase. How about “teaching authority.” This sums up the position I advance without getting tripped up over 1) the real existence of errors, and 2) the trap of speaking out of both sides of our mouths (i.e. by saying there are no errors at all, but we do allow for some). I was quite fair in decribing Ryrie’s method of painting himself into a corner. Nobody forced him to use narrower and narrower definitions until he was in an impossible situation. He did that all by himself. I’m also not sure which error involving numbers you are referring to. And I think this is the other thing that bothers me, Glenn, because I disagree with you: I think many of the ‘errors’ you cite do fall into that category. It bothers me because I think you have been far too quick, – the way a fundamentalist athest is! – to accept as ‘errors’ things that are genuinely better resolved as misunderstandings of cultural differences. And I don’t make this association to belittle you, but it really is what I am reminded of when I perceive you to be almost mocking or shaking your head in disdain at those who say they do believe in inerrancy. Take, for example, what Calvin says about the misattribution of the prophecy in Matthew 27. J.P. Holding offers a very simple, persuasive explanation of why a Jewish writer would attribute it to Jeremiah: http://www.tektonics.org/lp/mkone2.html. This makes much more sense to me than to say that the writer of Matthew somehow made a mistake and really didn’t know where the prophecy came from. In closing, let me say this: you may indeed have convinced me that inerrancy, of any sort, is not necessary to believe the general truth of the gospel message. But I still think that most putative ‘errors’ are not, in fact, errors at all. Anyway, that’s all I have to say on it. It’s true that many supposed errors in the Bible are not actually errors but are interpreted as such because we have forgotten/lost/misinterpreted information about the times in which the scriptures were written or the events. Hence some things really just don’t seem to make sense in today’s understandings. I have no doubt God wants us not just to take everything we are told at face value, but to be responsible and check out facts for ourselves. I have no doubt that the appearance of misquotes are testament to God’s will in this regard. However, taking into account the curse at the end of Revelation, and the many times the scriptures have been translated from one language until finally our modern english, and the fact that some translations have been undertaken/authorised by those who openly condemn the virtues presented in the Bible, there are undoubtedly bits missing, added and obscured. Only the Holy Spirit can reveal to an individual the many-layered truth that still remains. 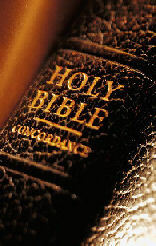 The Bible is still the ultimate survivial guide for those called by God. Firstly, those who say that “Jeremiah” was used by Matthew as a generic name for the prophets because he was the first or greatest have never – in all the Christian apologetics examples that I have yet seen, anyway – produced an example of a Jewish source from that period doing the same (quoting someone else but calling the source “Jeremiah”). That, by itself, is enough to make me reject their argument. Secondly those who try to get Matthew off the hook that way often try to play the same card one time too often. For example when Mark takes a prophecy from Malachi (referring to John the Baptist) and attributes it to Isaiah when actually it comes from Malachi, apologists for inerrancy then argue that this is acceptable because Isaiah (and not Jeremiah) is the greatest of the prophets! So firstly, the expalantion lacks evidence, and secondly it is used in an ad hoc manner when needed, and the rules about which prophet is the greatest seem to change. With all respect Tuck, I think the “far too quick” ones are those who merely accept the first expalantion given by an apologist for inerrancy, assuming that the matter has been resolved without looking further into it. Oh, one more thing Tuck. While I think inerrancy is clearly false, do bear in mind that the point of this blog post was not to argue that inerrancy is false, but instead to pick out a few historical examples of Christians who admitted of some errors in the Bible. For example, even if I didn’t convince you that Matthew made a citation error, I’m sure you’ll admit that I did show that Calvin thought that this was an error. Glenn, it would be interesting to hear more of your thoughts on inspiration, in addition to inerrancy. As with “inerrancy,” the word “inspiration” is often defined in vague, contradictory ways. I have encountered theology professors who assert that every word written in Scripture is inspired by God, but at the same time brush aside the “crude dictation theory.” But they’re the same thing. The view known as “dynamic inspiration” seems most logical, and would mesh well with what you have written in your posts on inerrancy. Dynamic inspiration: God directly communicates supernatural messages to his apostles and prophets, and they record them in their own words, perhaps with their own commentary (as Paul does when discussing celibacy), while the historical aspects of the Bible are recorded just as any historical work might be recorded, since it’s obvious to anyone reading the intros to the Gospels or Acts that the NT writers have done some investigative journalism. Glenn, thank you so much for these last few blogs on inerrancy. I’ve read through them and the comments, as well as the article at the other blog criticizng what you’ve had to say. You’ve no idea (actually, you probably do!) what it’s like being an intellectually passionate evangelical, feeling like you’ll be ostracized if you’re intellectually honest! For me the choice has been to either hide what you really think (and can see!) is true, so that you allow others to maintain a peaceful, comfy faith that doesn’t have to consider the possibility of a Bible that doesn’t float two inches off the surface of the table, having freshly dropped out of heaven – or expose yourself to the charge of being a liberal, “not as committed” to the teaching authority of Scripture, or any number of things. People will think that’s condescending, but the intellectual repression that some of us are made to feel among our peers is just incredible. We’re either willing to chant their shibboleth of “biblical inerrancy,” or we’re tarred and feathered as “liberal.” But I can’t deny reality! I can’t accept the contrived, ad hoc explanations given by fundie websites (and other decent websites that are tainted by such attempts). I can’t pretend that they are adequate just because they are the only explanations on offer! Glenn, reading what you’ve had to say on this has been really liberating. Thank you. You’re not in the least bit liberal. You’re just not willing to bend reality to make yourself feel better about your faith, and you know what – as you’ve discovered, honesty feels better anyway! Dave, yes I think the idea of “dynamic inspiration” makes the most sense and fits best with the facts. In short: God inspired the message. That perfect message was given to imperfect people with limitations and flaws in their knowledge to present in writing, and the result is the Bible. The message is perfect, the medium, including parts of it that do not form that message, are imperfect. And you’re right – to insist that inspiration extends to every single word is indisinguishable from a dictation theory of inspiration. But as soon as we start backing away from that theory, we open the door to errancy, which is fine with me, and fits the facts. While there has always been a clear expression of the view that what Scripture teaches is correct, this has certainly not always been seen in terms of the notion of “inerrancy.” After all, the very disagreement that exists between evangelicals who affirm inerrancy and those who do not is whether or not the idea that the Bible is authoritative and truthful in what it teaches us should (or need not) give rise to the further claim that the Bible is also inerrant. This is interesting, you draw a distinction between “inerrancy” and the claim that “whatever the bible teaches is true and nothing it teaches is false” . What I find interesting here is that if someone asked me if I believed in inerrancy I would respond by saying ” I think that what scripture teaches is true” . I would then point out that many things skeptics make an issue about are not taught in scripture. For example the so called three tire universe that skeptics go on about is not “taught” in scripture any more than a 13 century writer who talked about a battle occuring at sun rise was intending to teach geocentricism with this statement. I understand that this is how Bill Craig defines inerrancy. Over at http://www.reasonablefaith.org/site/News2?page=NewsArticle&id=5717 which is quite interesting. I think the same is true with the Gospels. When one compares Matthew and Mark regarding Jesus debate with the Pharisees on divorce, I simply do not think either intended to teach that “the discussion occured in this order” what they are simply both using different narrative context to expound the same teaching. I take it that this is what you mean to affirm. Yes Matt, that is what I mean to affirm. Scripture affirms some things that aren’t really part of its message (i.e. they aren’t part of that which it teaches). I think that minor errors of the type that I’ve mentioned fit into that category as do the kind of things you bring up as well (like false cosmologies that the biblical writers assume are true). I make sure that I include both of those types of things when explaining why I’m not an inerrantist. (e.g. the kind of things that I identify as errors are not merely things reported in a different order). I realise that some want to define inerrancy that way, but I really find it unhelpful just because another use of that word was already kicking around before they started to do so. I also find that most who claim to embrace inerrancy deny the existence of minor errors (but some – although not all – of them allow for the false scientific assumptions), so by naming myself as one of them, I’d really just be causing confusion. But yes, you’re reading me right. Comment removed. Please see the blog policy on linking.